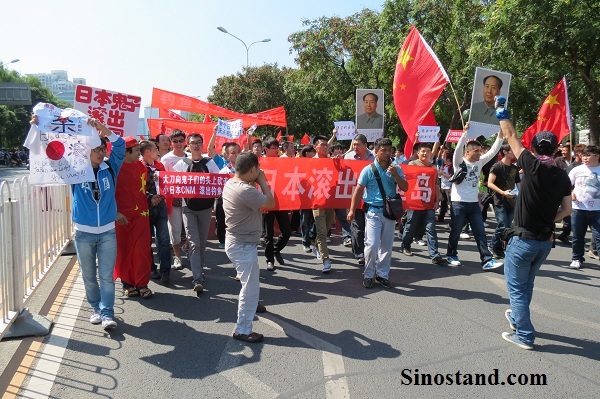 Today saw huge demonstrations in front of Japan’s Embassy in Beijing to protest Japanese claims over the Diaoyu Islands. 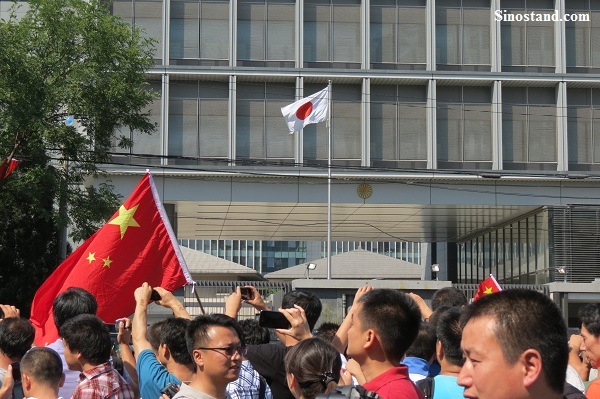 Two years ago when tensions last flared over this issue, I checked out the Japanese embassy in Beijing, where there were no more than about 50 people. This time, turnout was exponentially bigger and more serious. I got to the embassy at about 1:00 this afternoon. The roads around it were all closed off to traffic with a few hundred riot police, regular police, public security volunteers and lord knows how many plain clothes officers. I estimate there were at least 2,000 people while I was there, although it’s unclear how many actively came to protest and how many were just curious onlookers. This mass outpouring obviously had official sanction. 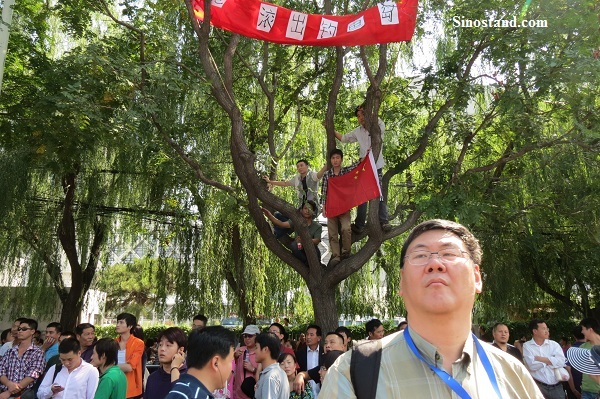 The police’s presence was to direct the protests rather than try to hamper them in any way. Later things started to get a bit more intense. 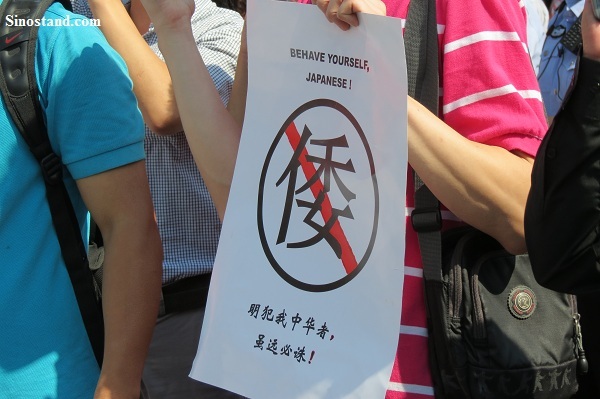 While the crowds circled around they were allowed to stop briefly in front of the Japanese embassy itself. 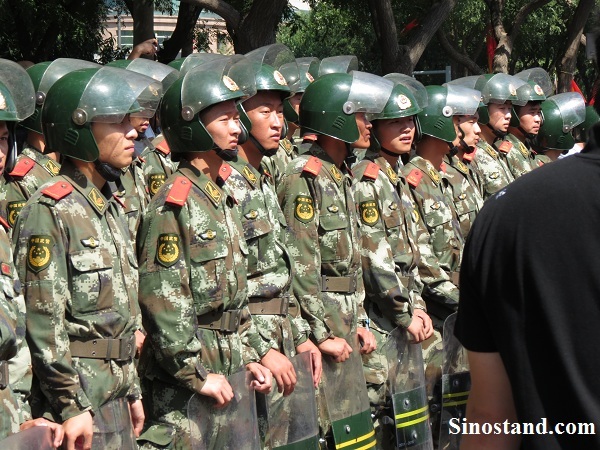 It was guarded by hundreds of riot police with helmets and shields. At first protestors threw water bottles and eggs at the embassy, which police made no attempt to stop. But gradually rocks and (I assume Japanese) cell phones started to be thrown. 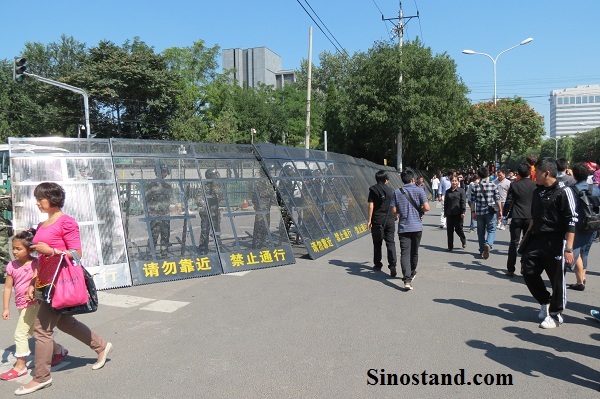 Many of them hit the Chinese police, who were covering themselves with shields. Finally I went to interview a man on the side of the road holding a sign. As I was speaking with him a police officer grabbed my shoulder and turned me around. “What are you doing,” he asked forcefully in English. I said I was just talking with people and taking pictures. He pulled me toward a small police post on the side of the road and demanded my passport. He looked at the visa page, handed it back and then seemed to get distracted with something else. I slowly but steadily walked away. It was very strange. It seemed like coverage was being encouraged. 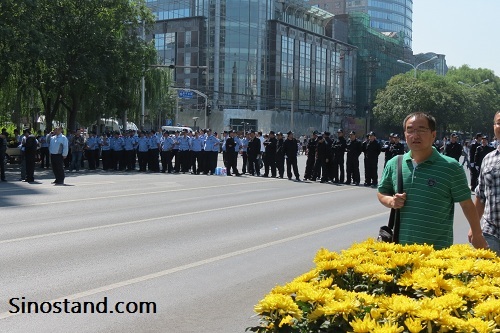 I didn’t notice any of the other foreigners who were taking video/pictures being hassled. I’m not sure why I was singled out. That was about the time I headed home. 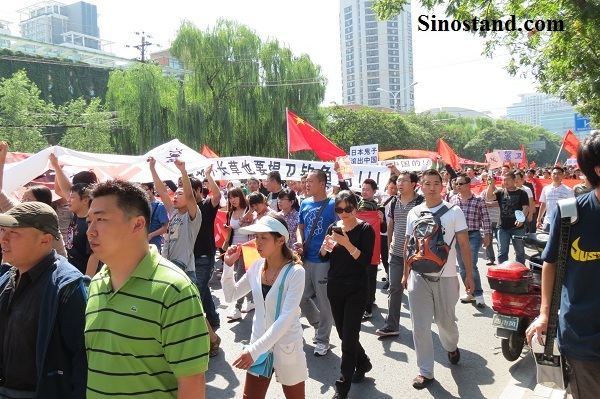 If you didn’t understand what the people were chanting, the whole atmosphere of the protests seemed very festive. People chanted things, others laughed. Families with little kids were out, young people, old people. It kind of felt like a 4th of July parade…until things began to be thrown at the embassy. 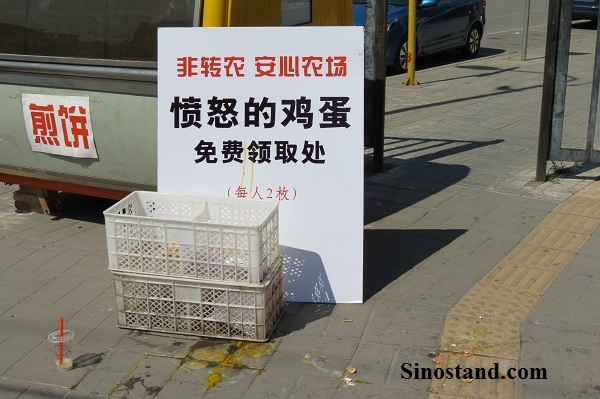 It’s interesting to speculate on how much of this was deliberately egged on by the CCP. The whole thing erupted when the Japanese government bought some of the islands from a private owner. 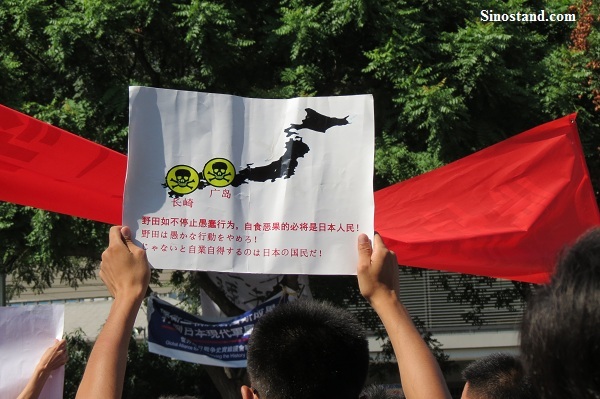 The move was intended to put the islands under national control so Japanese activists could be prevented from planting flags on the island and stirring up tensions. 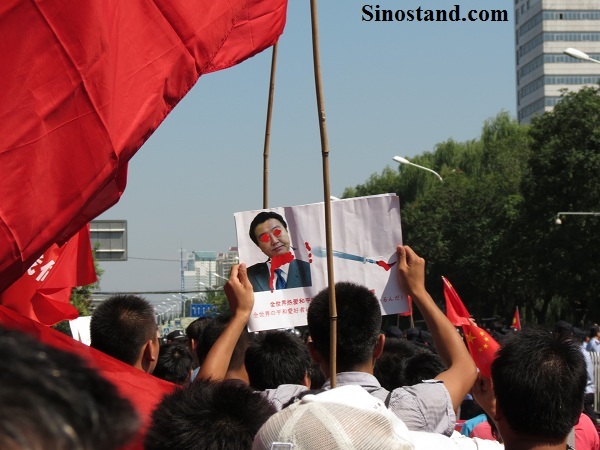 But it seems that was a huge miscalculation by Japan on the eve of China’s 18th Party Congress. 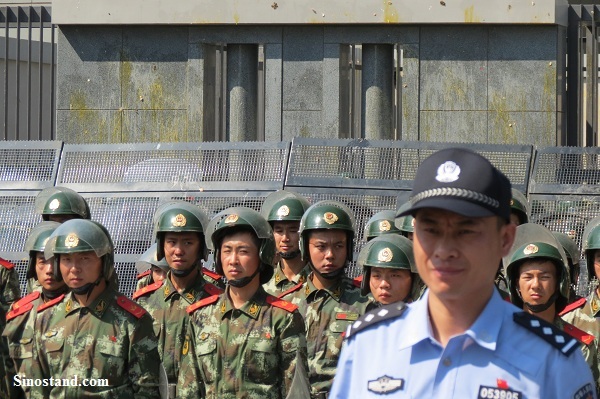 The Chinese media could have lauded the move as an attempt to ease tensions and work toward a peaceful solution, but it went hard in the opposite direction, portraying it as an illegitimate slap in China’s face. It’s no wonder so many are riled up. 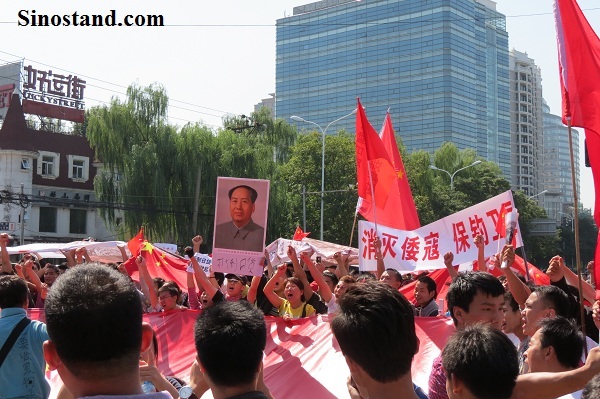 It is important to note that when you see Mao posters being paraded, it’s probably a pretty poor representation of Chinese people. And it’s hard to say how many people present at the protest were active nationalists, how many came because they thought it’d be cool or interesting, and how many just happened to walk by and stuck around. But there was a lot of intensity. Whenever someone started a chant, most joined in. 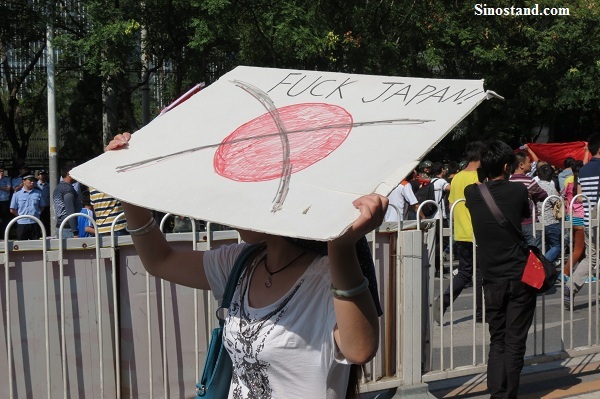 This is clearly the most serious clash between China and Japan in a long time, and it could be far from over. A few days from now will be September 18th, the anniversary of Japan’s invasion of Manchuria. Unless there’s a police clampdown, the protests are likely to continue through at least that day. With Xi Jinping back and all this intense anger directed toward Japan, I predict China’s leadership transfer can now go off without a hitch.